This Adorable Pup’s First Puppuccino Is Going To Make You Smile! Not many restaurants offer special items just for dogs, but pup parents are always happy to discover one that does! Starbucks is actually one of them, surprisingly. They offer a cup full of whipped cream – known as a puppuccino – to families who bring their pups along, and it’s a huge hit with most dogs who get to try it! 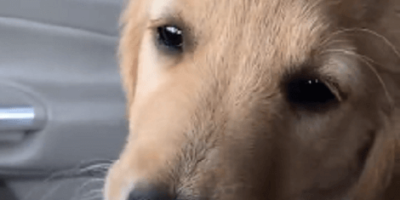 Waffle the golden retriever puppy is quite excited today as she gets to try a puppuccino for the first time. At just 3 months old, it’s as good a time as any to start embarking on new experiences and trying new things. The moment she gets her first lick of the cream, she’s in love! She works her way through the cupful, eating as much as she can. Waffle is certainly very happy with her delicious treat! Something tells me that although this was her first ever puppuccino, it’s far from her last. This Adorable Pup’s Floppy Ears Are Definitely Going To Melt Your Heart! Watch How This Adorable Pup Just Leans Over His Baby Sister Sitting In The Tub!